The fields ARE ripe unto harvest. God’s heart is for every and all peoples to have the opportunity to come to know Him and have the opportunity to receive the gift of salvation because of His Son. Prayer brings us directly into the larger perspective of what God is doing! Jesus’ solution was always prayer. Prayer changes things! Technology is opening doors that previously have not been available. Repositories of Scripture are available through the internet like Bible.is and YouVersion. There are websites such as OneStory: Listen Now http://www.onestory-media.org/ that offer multiple language story sets and  Afghan Radio: The Sound of Life http://afghanradio.org/en/scripture/oral-bible-stories where God’s Word is available in the Dari language. God is making a way. Over the past few years we have seen a shift in our network of ION to be given the opportunity to influence the Body of Christ to make disciples of oral learners in ways that go far beyond our original ideas of orality. For the past several summers, theological schools have been hosting ION Theological Consultations to discuss and bring awareness in the seminary world of the reality of oral learners in their classrooms. And discussions are wide open in regard to formal and non-formal theological education. Please continue to pray for more open doors such as this. 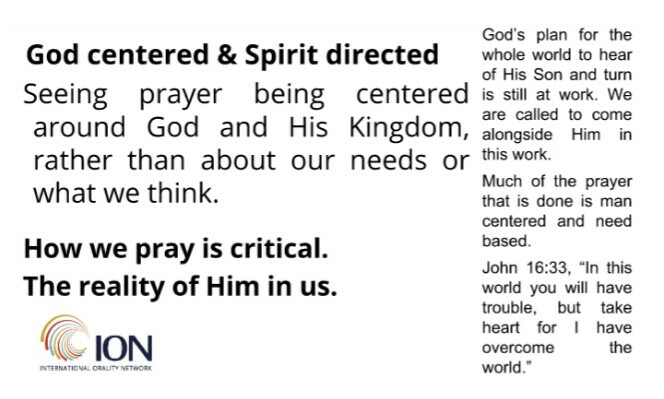 The focus has shifted us from what “we are doing” to “what God is up to.” We are moving into a fuller appreciation and operation of being God-centered and Spirit-driven, remembering the 18 months in praying for the Unengaged Unreached People Groups (UUPG) listing, name by name. 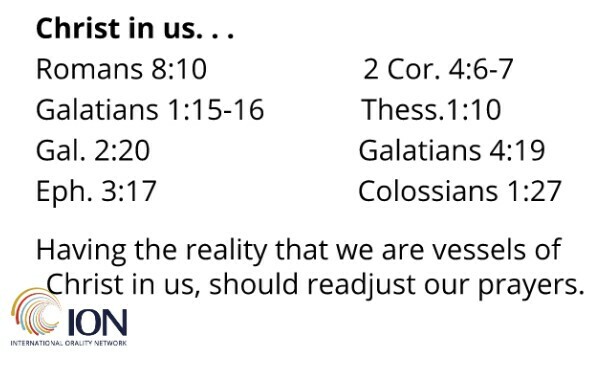 We linked it to the larger prayer initiative of Ethne/Harvest Prayer (see a sample from Dec. 2013 ION Prayer Focus). We did not give up, but we continued to press in calling others to join to pray for each people group to have SOMEONE who would be willing to reach toward them. Pray for more workers in the area of prayer mobilization. The Body of Christ needs to be mobilized to pray in this area into the future. 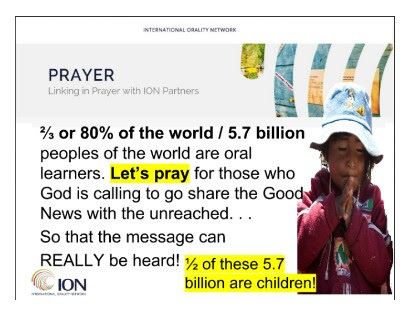 From that 18 months, we began to ask God, “How do we pray for the oral peoples of the globe?” In October 2014, we began to ask the intercessors and pray-ers to move into a different format of prayer: To listen to the Bible in 90 Days (https://orality.net/prayer/bible-in-90-days-prayer-initiative/) as a way of connecting to oral peoples and those peoples who do not yet have Scripture in their heart language or mother tongue. We were wondering what it might be like for Scripture engagement to involve listening and praying. Now we are asking more boldly for God to send the workers into His harvest fields in the area of Bible translation. How is it that after 2000 years, still not everyone has access or the ability to hear of Jesus Christ? How is it possible that those of us in the West have stacks of Bibles in our homes and there are still 1,778 peoples who do not have one verse? As we allowed God to open our ear gates to His Word, something different began to happen. God began to bring a greater reality to us of the 5.7 Billion people (with over half of those numbers being children) not having the same access to Scripture that we knew, it shifted us. It shifted our prayers. God’s heart is for the every and all to have access to Him and to hear the name of Jesus. He can and will bring a new awakening to the Body of Christ. We are believing that the Body is being reset this year of 2016, the year of REFRESH. Having finished a year of intentional listening, we acknowledge that as we shift into this second half of the year, we are allowing Him to recalibrate us. We are asking God for some very big things. He is a very big God! The globalization of ION is upon us as a network. Praise God, we are seeing people all over the globe catch the vision of reaching the oral peoples. Prayer and fasting is the key to moving into next levels. That reminds us of a story. After the experience of Transfiguration, the disciples had the opportunity to come to a new awareness of what would be needed. You remember the story in Mark 9. They tried unsuccessfully to deliver the young boy, but to no avail. “After Jesus had gone indoors, his disciples asked him privately, “Why couldn’t we drive it out?” He replied, “This kind can come out only by prayer and fasting.” And this same story back in Matthew 17, “Then the disciples came to Jesus in private and asked, “Why couldn’t we drive it out?” He replied, “Because you have so little faith. Truly I tell you, if you have faith as small as a mustard seed, you can say to this mountain, ‘Move from here to there,’ and it will move. Nothing will be impossible for you. Prayer is a part of His foundation, because of who we are as sons and daughters of God. We must help everyone feel able and needed to pray. We must “demystify” the call to prayer as being something more than what it is. . . Prayer is simply part of our ordinary life as a believer. Have you thought of yourself as a prayer mobilizer or a prayer strategist? In the Scriptures, many times, those who led in prayer also mobilized prayer. They too, were the ones who brought the strategy of prayer to the people. We are in a very critical time in the history of the church. It will take everyone doing their part and being willing to link together in the area of prayer to pray in those who still wait. Prayer is not a department or a small group who “takes care of our prayer requests.” In prayer we must allow ourselves to simply “be” with Him. To understand prayer as the foundation of everything we do is critical for every believer and every group involved in the work of God. Prayer is essential to the work of God. It is His work. Prayer is how we come into agreement with Him. That takes listening to Him and trusting Him fully. Trusting the Holy Spirit for the power to accomplish, because we simply join the Son as He intercedes to the Father. As a son of God we join in prayer for the Every and All. Join in believing God is able to finish in and through His body what He has set before us. 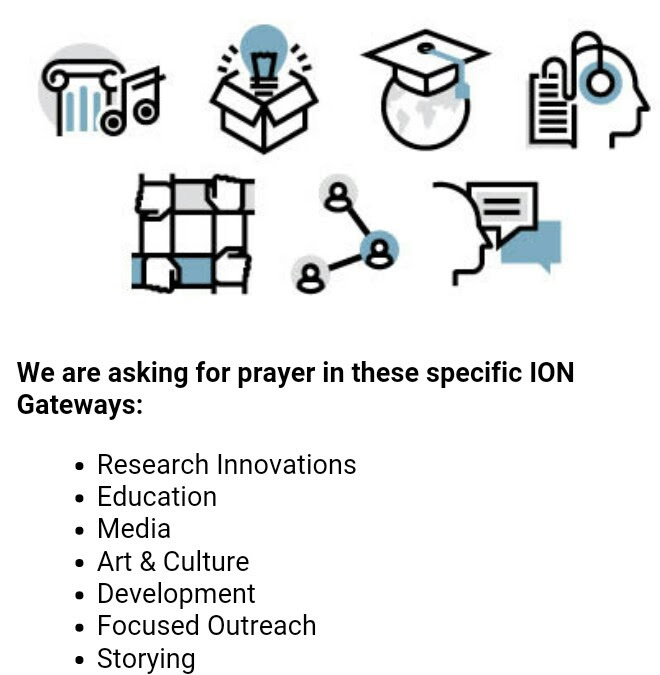 In the ION network we have many working in prayer who are helping others to see how they can fit into God’s plan raising the level of awareness and advocacy for prayer. 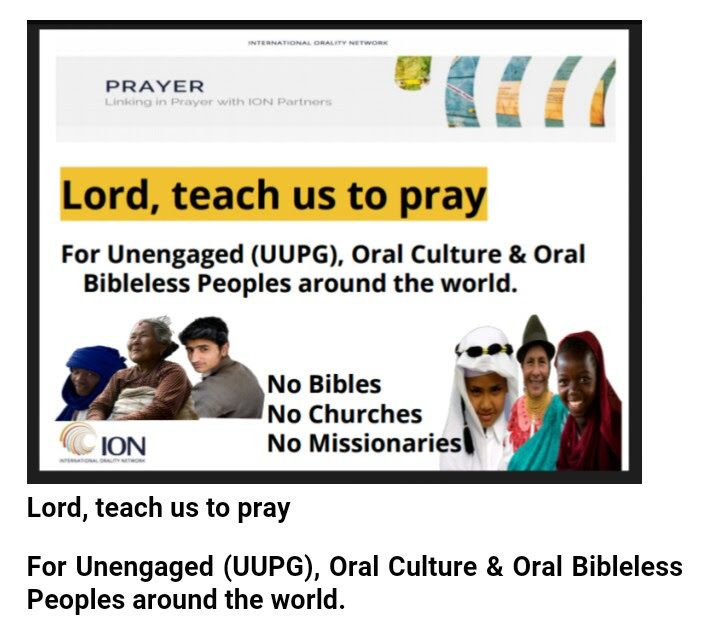 Lord, teach us to pray For Unengaged (UUPG), Oral Culture & Oral Bibleless Peoples around the world. UUPG Prayer Adoption ppt. Click Here to View. 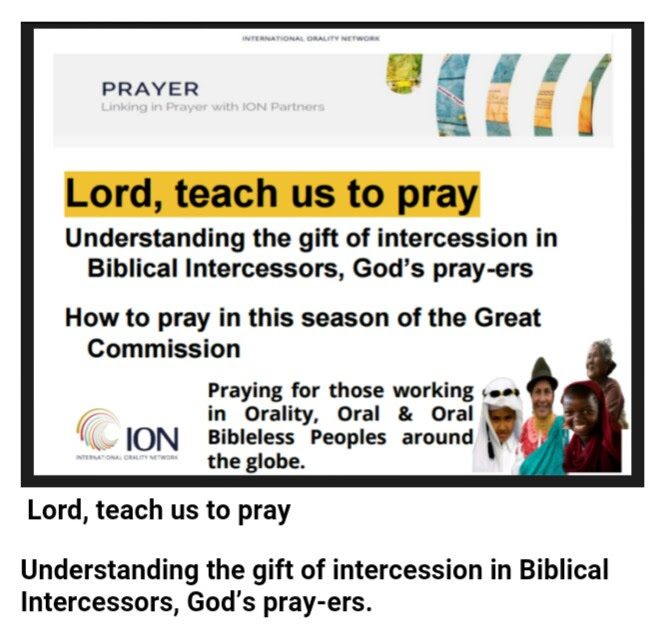 Lord, teach us to pray Understanding the gift of intercession in Biblical Intercessors, God’s pray-ers. Prayer Powerpoint ppt. Click Here to View. Previous PostHistory Belongs to the IntercessorsNext PostWhat Is Wholeness Prayer & How Can It Be Used to Strengthen Movements and Strategy Teams?